What SAMS-art can offer ? 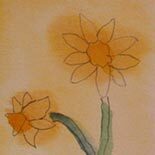 SAMS-art can provide creative art services for residents of residential and care homes within the Greater Manchester area. 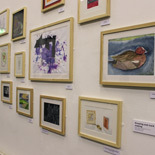 To decide whether the service would be beneficial to residents, SAMS-art can provide a introductory offer for two sessions just to see how the sessions can work for each individual. A regular routine for individuals is advisable, and can be arranged weekly, fortnightly or monthly. Below are just some of the sessions I can provide. If you had a particular project in mind, please get in touch via the contact form. 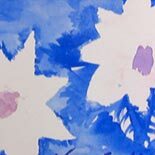 Working with a well-established process, individuals can create paintings in watercolour of many subjects including Landscapes, Buildings, Animals and Flowers. Using anything other than paintbrushes to create paintings, such as palette trowels, lollipop sticks, forks, cutter shapes. 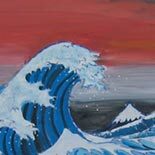 By working with thick acrylic paints, interesting patterns and textures can be created. 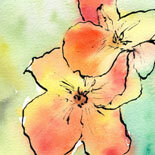 Using the simple method of monoprinting, individuals can create prints, which can be painted over the embellish them. Different techniques for making pots and other containers. How to make various flowers with simple techniques. You could combine this workshop with the �Containers and Jars� session and make a Vase of Flowers. 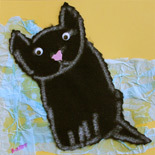 How to make your favourite animals including dogs, cats, birds, bears, hedgehogs - almost anything! Painting and decorating a flat surface to create a plaque. Using a variety of mediums, such as charcoal, pastels, oil pastel or wax crayons to draw artwork of a selection of objectssuch as flowers, fruit, shells and themed still life items. Looking at the more �technical� side of drawing for those who want to more about areas such as perspective, mark making, composition. Working with magazines, newspapers and leaflets, participants can create artworks through cutting and tearing colours and creating an image or pattern onto card. Working with glass paints and acrylics on transparent acetate to produce see-through pieces of artwork. 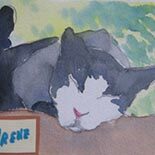 Either using watercolours to paint images, or using basic printing shapes and coloured papers to create cards - possibly for friends and family! A very simple, but effective workshop creating coasters with different painted pieces of paper and other mediums. 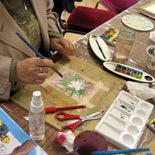 Participants can paint coloured paper to then cut up and produce paper mosaics. Either using patterns or an image to create a final piece of work. This could be spread over 2-3 sessions if required.